The five forces shown in Fig. P-314 are in equilibrium. Compute the values of P and F.
Figure P-313 represents the concurrent force system acting at a joint of a bridge truss. Determine the value of P and E to maintain equilibrium of the forces. Determine the magnitude of P and F necessary to keep the concurrent force system in Fig. P-312 in equilibrium. 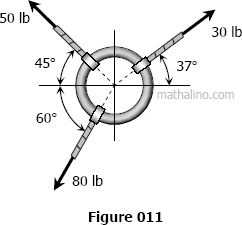 Forces F, P, and T are concurrent and acting in the direction as shown in Fig. P-015. Find the value of F and α if T = 450 N, P = 250 N, β = 30Â°, and the resultant is 300 N acting up along the y-axis. Find the value of F and α if T = 450 N, P = 250 N, β = 30Â° and the resultant is zero. Find the value of α and β if T = 450 N, P = 250 N, F = 350 N, and the resultant is zero. From Fig. 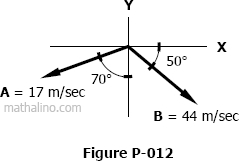 P-014, P is directed at an angle α from x-axis and the 200 N force is acting at a slope of 5 vertical to 12 horizontal. Find P and α if the resultant is 500 N to the right along the x-axis. Find P and α if the resultant is 500 N upward to the right with a slope of 3 horizontal to 4 vertical. Find P and α if the resultant is zero. 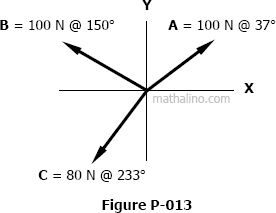 Three vectors A, B, and C are shown in the figure below. Find one vector (magnitude and direction) that will have the same effect as the three vectors shown in Fig. P-013 below. Find the resultant vector of vectors A and B shown in Fig. P-012.